add the penne and cook for 6-7 minutes. strain the water and reserve the penne. add the sliced onions and fry them till they become light brown. add the crushed garlic and fry for a minute or two. add the chopped tomatoes now and saute them till they become soft. now add all the herbs, salt and pepper and mix it with the rest of the tomatoes. saute the tomatoes till they the entire mixture becomes one. this will take about 20-25 mins on a low flame. keep on stirring in after couple of minutes when the tomatoes are getting cooked. the mushrooms will loose water and then shrunk in size and then get finally cooked. this process will take about 15-20 minutes. finally add the olives and saute for 2-3 minutes. 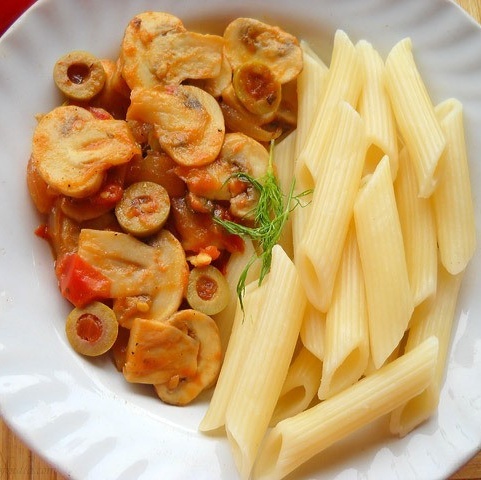 serve the penne with the tomato mushroom and olives.